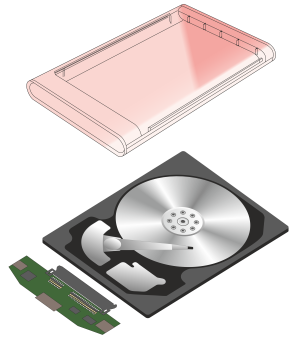 In today’s world there are two types of hard drives – hard drives which are connected directly to a PC motherboard and drives placed in a special box which are connected via USB. Internal hard disks are used to store both user data and system data (that is, the system is booted from them). External drives are typically used for backups and user data. Internal hard drives are connected to a PC via SATA cable while external drives – via either USB cable or WiFi. In modern hard drives, typically, 2.5” disks are used – this is because such disks weigh less and therefore they are easy to carry. Disk enclosure can be very diverse — manufacturers try to make them more stylish, so that the disk is not perceived as boring data storage, but as an accessory that you carry with you in the bag. As for typical external drive capacity — as of 2017, the maximum size of external disk that you can buy is 10 TB. 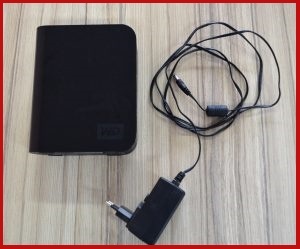 In addition to the «simple» external drives that are designed to be portable, there are also so-called desktop external hard drives. In other words, these are boxes that stand on your desk and provide you with extra storage capacity. Obviously, such disks are serviced by one computer and are not transferred (at least often) to another one. Desktop external hard drives usually consist of several drives combined into one storage with RAID technology. Such storage devices typically use 3.5” hard disks. One more difference between desktop and portable external hard drives is in the power consumption. Portable external hard drives consume the power of the PC via USB cable, while desktop external hard drives have their own PSU.